"Researchers who perceive that they are being unfairly treated are less likely to report engaging in 'ideal' behaviors and more likely to report misbehavior and misconduct," according to a survey of faculty at fifty top research universities in the United States. As the authors note, this is mostly a quantitative confirmation of earlier findings. 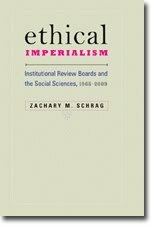 Most relevant for this blog, they cite a 2005 article by Patricia Keith-Spiegel and Gerald P. Koocher that found that "The efforts of some institutional review boards (IRBs) to exercise what is viewed as appropriate oversight may contribute to deceit on the part of investigators who feel unjustly treated." Like the Singer and Couper article in the same issue, this article presents a mass of quantitative data in a difficult form. Let me suggest that the Journal of Empirical Research on Human Research Ethics invest some money in decent graphs.